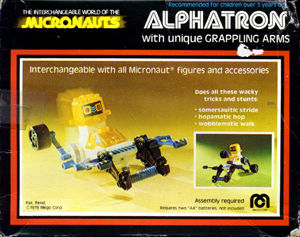 The box art for Alphatron, one of the goofy Micronauts, similar in intent to Takara's Uniquer Force in the Microman line. Alphatron, Gammatron and Betatron are almost identical to each other, with the exception of some of the arm accessories. Alphatron sports "unique grappling arms."